California Water Service is currently offering rebates of up to $1000 for lawn removal and replacement with drought-tolerant plants in single-family residences. It's not difficult to realize landscape water savings of over 80% through careful plant selection and site preparation, and accurate application of irrigation according to the plants' actual needs. If you plan to undertake a lawn replacement, make sure you do it properly; incompletely killed grass can regrow amid new plantings, ruining the appearance of your new landscape and creating a maintenance nightmare. The following three steps will lead to success. Step One: observe and plan. What existing trees and plants do you want to keep or remove? What are the sun and shade patterns within your yard? What types of grass grow in your lawn? Do you want any additional amenities, such as paving or a shade structure? How will you irrigate your new plants? Step Two: kill your lawn. Homeowners can use two eco-friendly methods to kill their lawns: Solarizing or Sheet Mulching (also below). Solarizing uses the sun's radiation to kill lawn grasses as well as many common annual weeds, harmful soil microbes, and seeds down to a depth of 4 to 12 inches in six weeks. Most beneficial microbes survive, including earthworms. Solarizing requires six hours per day of full summer sun and takes 4 to 6 weeks to complete. It works best on fescue, ryegrass, and bluegrass, with partial success on Bermuda grass. Solarizing must be completed before new plants are installed. Sheet mulching kills weeds by starving them of light. It takes 6 to 10 months and can be started any time of the year as long as at least three months of growing season are included. Sheet mulching works in sun or shade, and is effective on all grasses, including Bermuda grass, and many annual and perennial weeds. It is left in place permanently; over time, the dead lawn, sheeting, and mulch will break down into soil-enriching compost. Sheet mulching should be placed before new plants are installed if being used alone to kill lawn or weeds. It can be placed after plants are installed if solarizing has been completed first. New hardscape and irrigation should be installed before commencing solarizing or sheet mulching. A third option for lawn removal is to dig or scrape out the lawn. Be warned, however, that this method will not kill Bermuda grass and most perennial weeds, which have deep roots that will re-sprout. If you choose to dig out your Bermuda grass lawn, be sure to follow up with sheet mulching to prevent aggressive regrowth of the grass. Step Three: replant. Whichever method you choose to kill your lawn, time implementation so that you are ready to replant in the fall, winter, or early spring. The cool temperatures and moist soils of our wet season allow drought tolerant plants to develop the healthy roots they need to thrive with little water during the heat of summer. Taking time to thoroughly kill the grass and waiting until the climate conditions are suitable for new plants will ensure the long-term success of a lawn replacement project. For additional information about the CalWater turf replacement rebate, visit their website at www.calwater.com. Sheet mulching, also known as sheet composting, kills weeds by starving them of light. Dead plant material will break down into compost to enrich the soil. New weeds are reduced because it is difficult for them to anchor their roots in deep mulch. The sheeting and the mulch will break down over time, forming compost. Sheet mulching should be placed before new plants are installed if being used to kill lawn or weeds. It can be placed after plants are installed if other weed removal techniques such as solarizing have been completed first. Newspaper or plain cardboard. Don't use glossy colored pages as they may contain metal pigments. Water from a hose with a spray attachment. Compost or worm castings in a 1-2” layer. Quantity calculation for mulch is: (Area in square feet) x .08 to .15 ÷ 27 = cubic yards of compost required. Note, if you are replanting with native CA plants, you can omit this step. Wood chip mulch in a 4”-6” layer. ‘Walk-on' bark, has longish strips of wood and barks that knit together to help it stay in place. Shredded wood/barkmayalsobeavailablethrougharborists for much less cost; verify with the supplier that it is disease free. Quantity calculation for mulch is: (Area in square feet x .33 to .5) ÷ 27 = cubic yards of mulch required. Scalp your lawn or weedy area with mower set at lowest setting. Remove grass/weed clippings. Water the soil thoroughly. To prevent runoff, you may have to apply water for a short period, wait for it to soak in, and then repeat as needed. 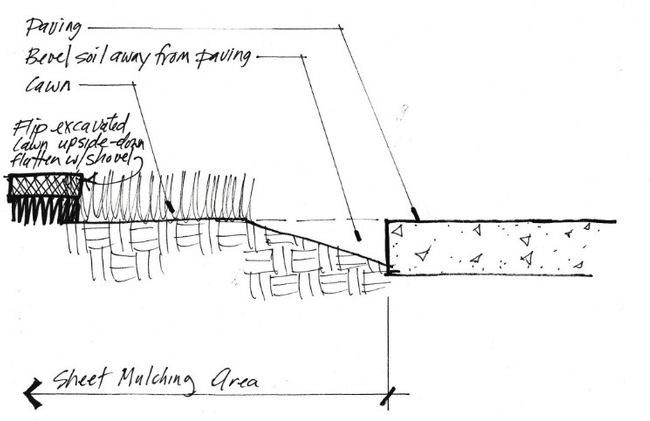 To reduce spillage of mulch onto adjacent paving, dig a shallow beveled trench along any edges that are bordered by paving. See drawing, below. Spread 1-2” depth of compost or worm castings over entire area. On a windless day, place newspaper (about 5-8 sheets thickness) or cardboard over grass to be killed, overlapping like shingles. Make sure there or no gaps or holes. Lightly sprinkle newspaper with water as you go to prevent it from blowing away. Once wet, the paper will easily tear; be careful when walking on it. If it tears, place additional newspaper over the hole. If you are laying the sheeting around existing plants, keep the paper a foot from the plant stem, further for plants that spread by underground stems. As you are laying the paper, place wood mulch over the top of the paper to a 4”-6” depth. Place the mulch as you lay the paper so you don't have to walk on/tear the wet paper. If you are placing the mulch when the plants are already in the ground, keep the mulch a foot from the plant stem. Sheet mulching requires 6-10 months to kill a lawn. It can be left in place permanently. 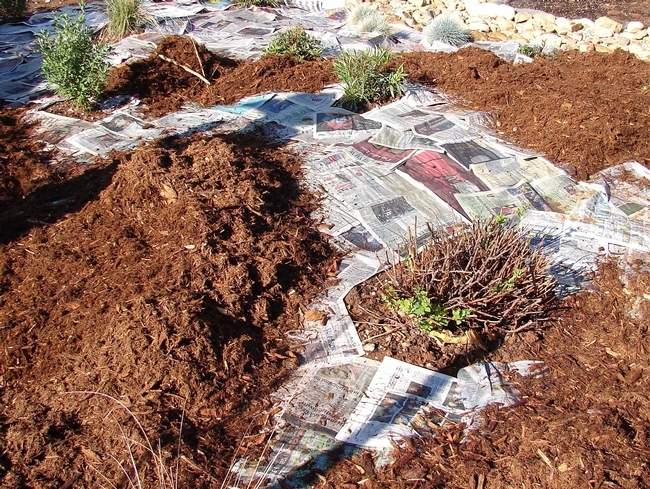 To plant with sheet mulching in place, push back the mulch and cut away paper sheeting in a circle wide enough to dig your hole. Dig the planting hole 2x the width and 1x the depth of the plant root ball. Loosen coiled roots and place the plant in the soil so that the top of the root ball is slightly above the adjacent soil. Back fill with soil from hole, forming a slight rim at the edge of the planting hole. Replace mulch, keeping it 8” from the plant stems. Beveled trench along the sidewalk, newspaper layered 5-8 sheets thick, and an initial layer of wood chip mulch. Reducing our water usage is even more important now that Governor Jerry Brown has issued an executive order to reduce urban water use. California Water Service Company (Cal Water) customers in Chico, for example, must reduce their overall water use by 32% from the amount they used in 2013. 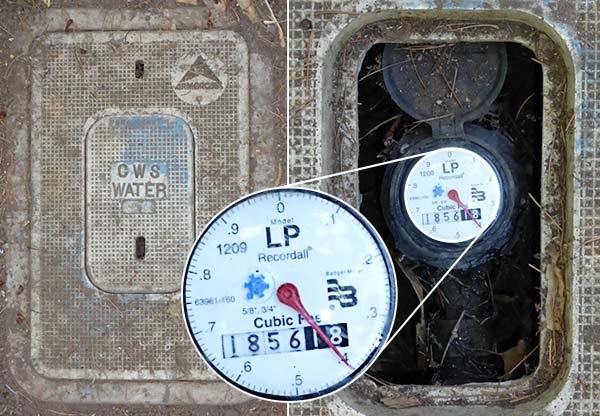 An important tool in helping us conserve water is the water meter. These are embedded in the ground and covered with a concrete plate. Most are located in the front yard of a residential property' near the property line and close to the street. To check your water usage, first locate your meter. Bring a screwdriver, a flashlight, and pen and paper with you. Use the screwdriver (or similar lever-type tool) to wedge into the slot on the “lid” over the meter, and lift it off; then shine the flashlight inside to make sure no black widows or other dangerous creatures are lurking in there. You will probably have to brush some debris off the face of the meter. When you do, you will be looking at a large circular dial, a smaller blue dial, and, below them both, a series of numbers. Write those numbers down. This is the base you will begin with. Once you have those numbers, you can start to calculate your daily water consumption. Each full number in front of the decimal point on that gauge represents one unit which is 1Ccf or 748 gallons of water. The numbers to the right of the decimal point are in 1/100s (one-one-hundreths) of 748. The larger dial moves clockwise, indicating water use up to 748 gallons; when that number is reached, the full number on the gauge increases by one. The smaller blue dial indicates that water is being used at that moment. If all of your water is shut off, the blue dial should not be moving. If it is, you have a water leak or water on somewhere on your property. There are several ways to use this information to become a more informed water user and to reduce overall water consumption. If you note down the water gauge number late on a night when you are not irrigating, then check the gauge again in the morning, you should be able to tell if you have a water leak somewhere on your property. –If the gauge tells you that water has been used when you have not, to your knowledge, used any water, somehow water is leaking out. Test how much water you actually use when hand watering with a hose. It certainly seems like hand watering uses much less water than sprinklers – but does it really? Check the number on your water meter, then, using a stop watch, see how much water you actually use in one minute with the hose on full force. Or see how many seconds it takes to fill up a five-gallon bucket watering can. Check that water meter number, then take your usual shower, and check that number afterwards. Subtract the smaller number from the larger and multiply that decimal number times 748. Your answer will be the number of gallons used. If you have an automatic watering system, record your pre and post irrigation meter readings, then use procedure above to calculate gallons of water used each time your irrigation system runs. Those living in the Paradise Irrigation District (PID) have access to a more advanced individual water-usage information system than those with Cal Water. The water meters of PID customers are green (easy to spot). A system known as "Aqua Hawk Alerting" reports water use every hour on the hour. This information is updated online every 24 hours. PID customers can log in online to view their previous day's water use. This system allows users to look at a daily water use graph which is helpful in evaluating the effect of their water-saving strategies. Aqua Hawk will notify customers by phone, text, or email if it detects a possible leak. This system also allows customers to specify an amount of water (in gallons) or an estimated bill amount (in dollars) that they don't want to exceed. If water consumption or bill amount exceeds or is projected to exceed the threshold value,AquaHawk will send a notification. This is very helpful in meeting water budgets. Cal Water has not adopted this reporting technology, but by logging in their account number online, Cal Water customers can view graphs of their monthly water usage, comparing 2013 and 2014 usage with the newly-reduced monthly targets. 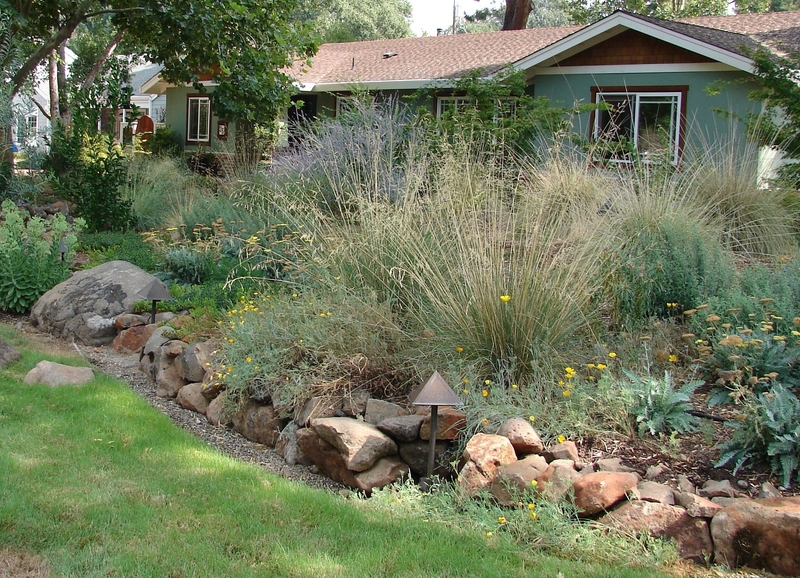 California Water Service is offering rebates for those in single-family residences who remove lawn and replace it with drought-tolerant plants. This is a great opportunity—it is not difficult to realize landscape water savings of over 80% through careful plant selection, site preparation, and accurate application of irrigation. . However, the current rules for the rebate require that homeowners complete their lawn removal project within 120 days of gaining approval to start work. Please note that four months is not enough time to properly kill many Chico lawns, especially those which contain Bermuda grass. If the lawn replacement project is started during the summer, the time restriction on the rebate forces replanting during our hot season, which can result in the stress or death of the new plantings. The optimum time to plant a dry garden is between November, when the first rains begin to fall, and February. Planting during that period gives plants a chance to establish roots before the summer heat arrives, and before the soil begins to dry out. In the meantime, you can properly kill your lawn. Our next Real Dirt column will explain how to do just that. Are you ready to reduce water consumption by removing your lawn? Fortunately, this doesn't have to be an expensive, back-breaking, or toxic undertaking. Sheet mulching, also known as sheet composting, is a non-toxic method of lawn removal that requires inexpensive materials, simple skills, and average physical ability. Sheet mulching kills lawns by starving them of light. Layers of different materials are spread onto the doomed lawn and left in place. Over time, the lawn and layering materials will break down into compost, leaving you with richer soil and beneficial soil microbes. Sheet mulching is effective on all types of lawn, including Bermuda grass. It works in either sun or shade. It can be started any time of the year. It will take six to ten months to kill a lawn using this method. A hose with a spray attachment. A one- to two-inch layer of compost or worm castings, if your plan is to create an edible garden or a traditional landscape garden once the lawn is gone. No compost is needed for most native plant gardens. Quantity calculation: (Area in square feet) x .08 to .15 ÷ 27 = cubic yards of compost required. A five- to six-inch layer of wood chip mulch. ‘Walk-on' type bark, available at landscape supply yards, has longish strips of bark that help it knit together. Trees companies can supply chipped wood/bark for much less cost; verify with the supplier that it is disease free. Quantity calculation: (Area in square feet x .41 to .5) ÷ 27 = cubic yards of mulch required. Scalp your lawn with the mower set at the lowest setting. Water the lawn thoroughly. If soil is compacted, prevent runoff: apply water for a short period, let it soak in, and then repeat as needed. 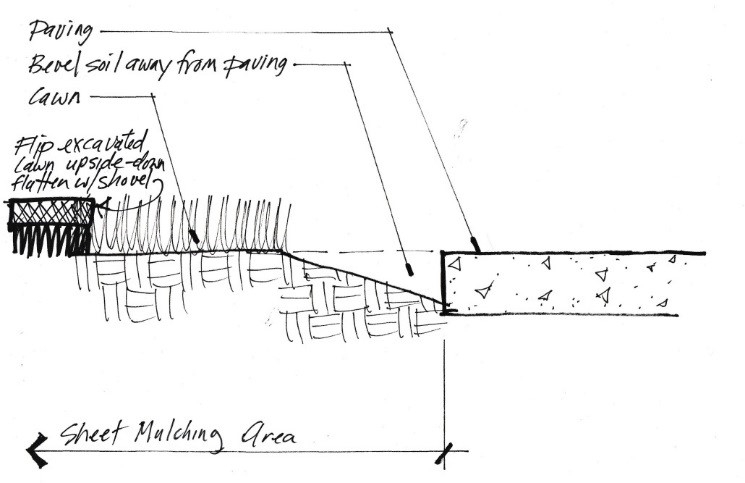 To reduce spillage of mulch onto adjacent paving, dig a shallow beveled trench at the perimeter of the lawn area. Flip excavated lawn pieces upside down onto the remaining lawn and flatten with the back of a shovel. Sheet mulching is most efficiently done by three people working together: one to spread the paper, one to sprinkle the water, and one to spread the compost and mulch. For an area where you intend to create an edible or traditional landscape garden, spread compost to a depth of one to two inches over the lawn. Omit this step for most native plant gardens. On a windless day, place newspaper (in thickness of five to ten sheets) or cardboard over the grass to be killed, overlapping it like shingles. Lightly sprinkle the newspaper with water as you go to prevent it from blowing away. Make sure there or no gaps or holes. If you are laying the sheeting around existing plants, keep the paper twelve inches away from the plant stems. 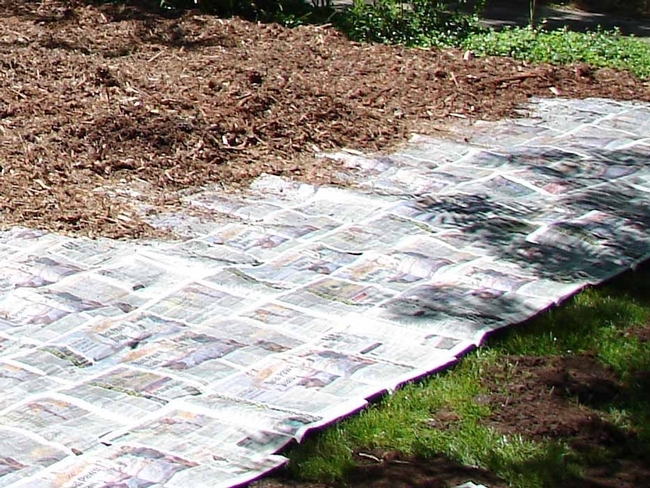 Apply the mulch as you lay down the paper to prevent the paper from tearing or blowing away. Put a five- to six-inch thick layer of mulch over the entire area. Leave the sheet mulching in place. Allow nature six to ten months to complete the work of killing and composting your former lawn. Looking for a way to reduce your water consumption? Landscape irrigation accounts for over half of household water use in non-urban parts of California. Replacing lawn areas with drought-tolerant native plants can cut landscape water use by over 80%, resulting in potential savings of around 750 gallons per week during the peak of summer for every 1000 square feet. A garden of native plants can provide color, texture, and seasonal interest while at the same time offering the single greatest opportunity for most homeowners to cut down on water usage. Lawns make an unbeatable playing surface. But many lawn areas, especially those in front yards, are rarely tread upon. Too often, they are grown by default for their reliable greenery. Keeping them lush and healthy expends resources in addition to water. Pesticides, fertilizers, and herbicides sometimes when applied to lawns can pose health risks to humans and leach into waterways. Gas-powered lawn mowers produce as much as 5% of the nation's air pollution each year. Native gardens, in contrast, provide beauty that is truly “green”. The following three steps can guide you in successfully converting your lawn into a native garden. First, observe. What existing trees and plants do you want to keep or remove? What are the sun and shade patterns? What types of grass grow in your lawn? Next, kill your lawn. Homeowners can use either of two eco-friendly methods to kill their lawns. 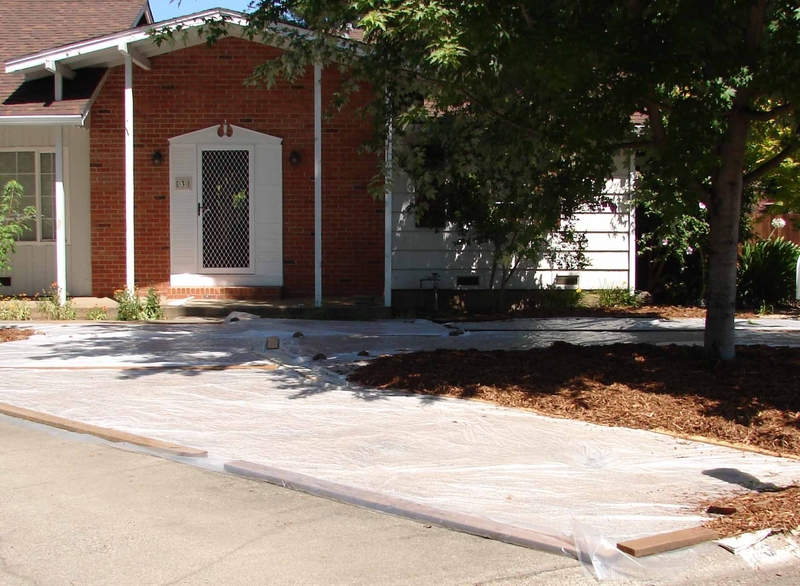 Solarizing involves heating the soil by covering it with a clear plastic tarp for four to six weeks during summer. It works best on fescue, ryegrass, and bluegrass, and with limited success on Bermuda grass. 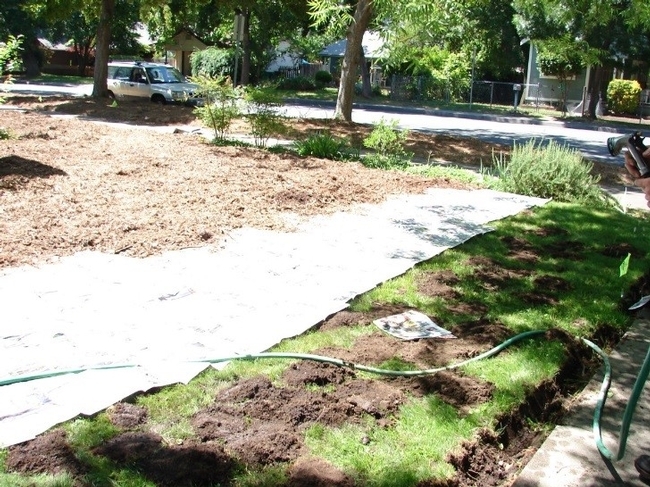 Sheet mulching is a method of layering materials (one of which is often cardboard) in order to inhibit the growth of weeds or (in this case) turf grass. Sheet mulching can be started any time of the year, takes six to eight months, works in sun or shade, and is effective on all grasses, including Bermuda grass. The UC Statewide Integrated Pest Management program website, http://www.ipm.ucdavis.edu, has information and instructions for both methods. Finally, replant. Whichever method you choose, time implementation so that you are ready to replant in the fall. The cool temperatures and moist soils of October, November, and December allow native plants to develop the healthy roots they need to thrive with little water during the heat of summer. It's a beneficial equation! A native garden can add a great deal to your garden while subtracting a chunk from your water bill. On Monday, March 10, the Butte County Master Gardeners will present a workshop on this topic at the Chico Library, located at the corner of First and Sherman Avenues, from 10 to 11 am. The workshop, “Replacing Your Lawn,” will present techniques for lawn removal; it is one of a series of workshops the Master Gardeners will present on Mondays in March to help home gardeners deal with the present drought situation.